Several Injured in California Bar Shooting Several Injured in California Bar Shooting: Police told the Los Angeles Times that at least 30 shots were fired at the Borderline Bar & Grill in Thousand Oaks. 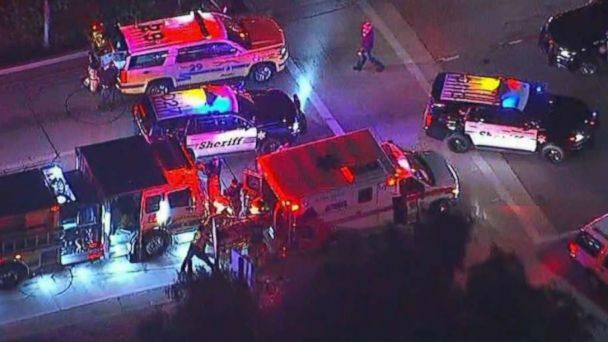 Several people are believed to have been injured in a shooting at a bar packed with college students in southern California, local authorities say. Ventura County Sheriff's Office Captain Garo Kuredjian said at a news conference early on Thursday that the sheriff's deputy was also among the injured and has been taken to a hospital. "Investigators are inside going through the scene to make sure it is safe," Kuredjian told reporters. "We don't feel that the shooter has left the bar and grill so whatever it is was contained inside." According to a report by Al Jazeera's Rob Reynolds, the bar was packed with college students before the gunman forced his way in. "The gunman used an automatic weapon and also threw in some sort of smoke bombs into the crowd in the club," he said. The degree of the victims' injuries has not yet been released. Law enforcement and emergency crews were flooding the scene. "He told us how he broke a couple of windows and him and his friends helped push women out to save them first. His hand was cut up and he has blood on his face. His friend was shot in the shoulder," the eyewitness said.